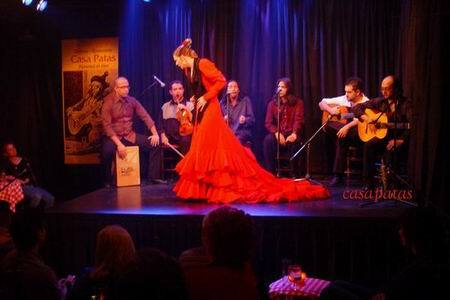 Casa Patas is a flamenco restaurant offering Spanish cuisine. Note that although GoMadrid.com strives to maintain all information about Casa Patas up to date, the prices mentioned are only an indication and may not reflect the exact value of your meal. The average price of a meal 'a la carta' at Casa Patas is 30 euros. The average price of dinner with show and drink is 61 euros. 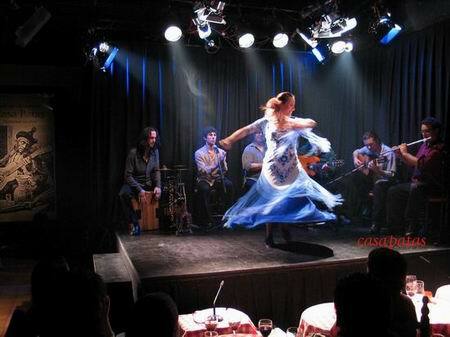 Please note that there are two different rooms, the restaurant room and the flamenco show room. Show times are from Monday to Thursday at 10.30pm and Fridays and Saturdays at 9.00pm and 12am, midnight. Entrance to the show is separate from the restaurant and the price is 31€ per person with one drink included. In order to book the show as well as your meal, please indicate in the remarks in the booking form on this page. Casa Patas is a restaurant and performance space that was founded in 1985 and is located at number 10 Cañizares Street, on the ground floor of a restored building originally built in the late 19th century in the Lavapies district. Important families belonging to the world of flamenco have lived in this district for more than 150 years. Casa Patas, closely tied to the characteristic idiosyncrasy of the district, has steadily been making a place for itself within the world of flamenco, and has today become a globally recognised point of reference for this art. Casa Patas has a spacious dining-room adorned with wrought iron columns that transports its clients to the world of flamenco while they sample the most traditional dishes and products of Spanish gastronomy. This dining-room has a spacious bar and 23 Andalusian-style tables. Its walls are lined with paintings and photographs of artists and public figures that have come to the restaurant or 'tablao' over the years. Artists of considerable stature such as Antonio Canales, Enrique Morente, José Mercé, Carmen Linares, Remidios Amaya, Niña Pastori, Sara Baras, and even Camarón de la Isla have visited this 'tablao'. Spanish cuisine is the restaurant's speciality, and the dishes here include typical Spanish food, traditional 'tapas', the best cold meats, cured hams and cheeses of the country, along with a select wine list that features the best 50 wines produced in Spain. Since its origins, Casa Patas has strived to offer a quality flamenco program because of the demanding local clients who are so closely tied to the world of flamenco. The combination of these two factors, a good program and demanding clients, has given Casa Patas the possibility to create a reputation of quality and prestige for itself. For years, the name of Casa Patas has appeared in the best guide books of Spain where it is recognised as one of the most authentic flamenco shows in the city. Although Casa Patas has never intended to focus exclusively around the tourist sector, it has never denied tourists the possibility of getting closer to flamenco in its purest form. As a result, it is always possible to find knowledgeable tourists in the 'tablao' who seek to go beyond the cliché and discover the essence of this unique art. Many artists, ranging from the novice to the well-known and acclaimed, have performed at the Casa Patas 'tablao' and on several occasions, music critics from the specialised press have praised the live shows, and Casa Patas has appeared many times in flamenco articles from foreign magazines and publications. Shows are held daily from Monday through Saturday. On Friday and Saturday there are two performances, the first show at 21.00 and the second at 24.00. Monday to Thursday, the performance starts at 22.30. The address of the Casa Patas restaurant is: Calle de los Cañizares 10, 28012 Madrid. The nearest Metro station is Antón Martín. Please see the Casa Patas restaurant location map below.